In this post I will show how different DataTemplates related to a hierarchy of classes can be nested and, therefore, reused. 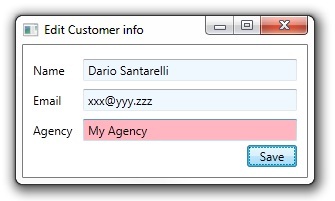 The concept is very simple, but its applications in a real scenario could be not so trivial! Let’s assume to have a base ViewModel useful for editing and saving an object of your model. If the object class is subject to some derivations, maybe you’d like to derive your base ViewModel too in order to fulfill the model inheritance hierarchy. Moreover, most probably you have to define different editing views taking into account the whole inheritance hierarchy. In that case, maybe you’d like to reuse more XAML as possible. So, let’s assume to have a base abstract Customer class and some concrete specializations, like EducationCustomer and GovernmentCustomer (see image below). Then, we design ViewModels in order to edit concrete instances of Customer class. In the class diagram below you can see a base ItemEditViewModel<T> which consists in a simple generic ViewModel which exposes a generic Item to be modified and a SaveCommand to persist it somewhere. The class also defines an abstract method OnCanSaveItem() which a concrete implementation must override in order to specify its own validation rules. and then, we can reuse the XAML above in the edit DataTemplate for the GovernmentCustomer and the EducationCustomer. This entry was posted on July 28, 2011 at 8:15 PM	and is filed under WPF. You can follow any responses to this entry through the RSS 2.0 feed. You can leave a response, or trackback from your own site.